As we drove away from the Choeung Ex Genocidal Center, my driver asked me if I was interested in going to a shooting range. While I turned down the offer, I couldn't help but wonder if a common reaction to visiting the Killing Fields was wanting to go do something pointlessly violent. 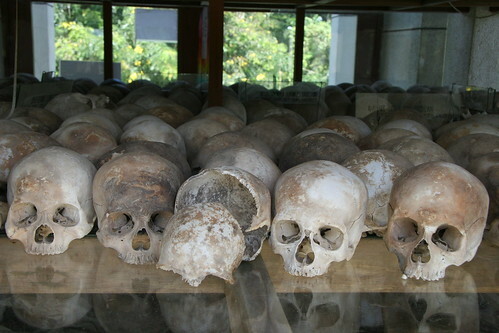 It's an entirely helpless feeling, wandering about this quiet place that was host to such horrors, and knowing that the thousands killed there - most of whose skulls you can view in the memorial chedi - represent a tiny fraction of those killed by the Khmer Rouge. I really wish I could say something meaningful, or hopeful, about the memories preserved here and at the Genocide Museum, but it's hard for me to believe that such remembrances, as much as they honour the lives destroyed, have meaning beyond this when genocide continues to happen. Beyond this, all I have to offer is silence. Wow, Bill. I don't know what to say except thanks for sharing so many personal moments from your trip. What a life experience. It's really quite stomach churning. Even so, It helps me to be more connected to the fact that it really happened if you share your experience; so thank you for that. The lack of meaning/hope was kind of how I felt about the movie Hotel Rwanda -- it's good that the story was told and a Western audience made more immediately aware of it, but how many stories need to be told before genocide never happens again? The detail of your driver asking about the shooting range afterwards was fascinating, though, so I'm glad you shared the photo and your experience.